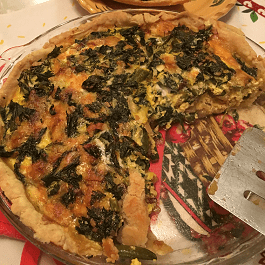 I love making quiche from wild greens. When we harvest healthy wild greens from unsprayed areas, the plants are so nourishing to us and our loved ones. It’s another layer of getting the medicine to the people in a way that they will love to eat! Cooking for people is one of my favorite things to do. My man builds houses all day and comes home filthy and hungry. 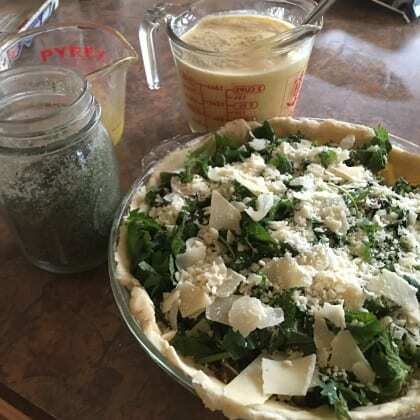 I like to pair up the quiche with a formidable salad full of wild and garden greens, chopped veggies, chopped nuts, dried fruit such as cranberries or raisins, fresh chopped apples, chunks of cheese and a good homemade salad dressing. I love to listen to him groan with pleasure as he eats. For me, that’s all the thanks I need. • 1 cup flour of choice. Cut the butter into the flour until they are completely incorporated with each other. Add 2 Tbsp cold water and quickly stir around with your fingers until the mass holds together in a ball, adding the extra 1 Tbsp water if needed. Toss some flour on the counter, and press the ball onto the flour until it’s slightly flattened. Turn over and dust both the counter and crust with flour. 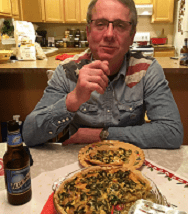 Roll out and place in a glass pie pan. 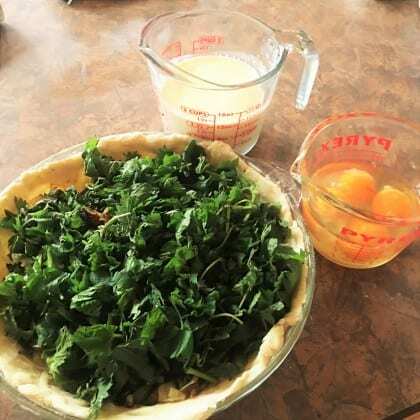 For easy transfer, fold the pie crust in half. Line the fold in the middle of the pie pan and unfold. Arrange the pie crust and pinch the edges to make them look cute. • 4-6 broken pieces of cooked bacon. That’s right. Bacon! God’s way of telling us He loves us. I suppose you could add andouille sausage or exclude meat all together, but that would be sad. • 2 cups chopped fresh wild greens of choice. Think fresh nettles, dandelion greens, wild mustard greens, plantain (the herb, not the banana. Remove the strings), and/or minced chickweed. • 1 cup shredded cheese of choice. I like to use cheddar, mozzarella and freshly grated Parmesan, peacause I’m cheesy that way. • 4 beaten eggs – I use the eggs from my chickens, so I know they’re organic and fresh. The yolks are a nice dark orange. You know they’re better than store bought! • 1 cup milk – always raw organic in my house. • 1/2 teaspoon nettle salt. I use Himalayan pink mineral salt for added nutrition. See blog for fresh herb salt recipe. Arrange on top of quiche: 1 thinly sliced tomato. Bake 45 minutes or until the middle is firm in a 375 degree oven. Serve to your favorite people. Watch them stare at you like you’re the best thing since sliced bread, which you are, you know.